Traditional mining in Pictou County has proven to be dangerous and in later years, uneconomical. Moreover, it has bequeathed the community treacherous landscapes riddled with pitholes, prone to cave-ins, and beset by coal dumps and outcrops bursting afire. Surface mining around old mine sites provides employment, and enables reclamation of this hazardous land. The heavy industry is not always welcomed, however, as some residents are concerned about its impact on their quality of life. 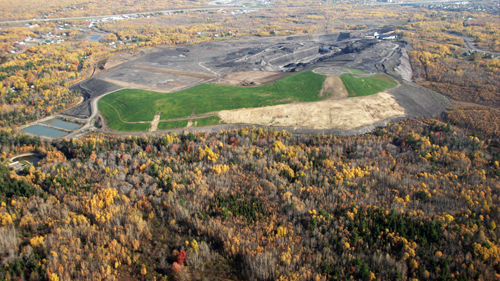 Land reclamation started with coal dump clean-ups in Stellarton and Westville (1975–1982). In 1985, the Pioneer Coal Company began surface mining around the old Drummond mine at Westville; by 2007, mining was completed there and at sites in Thorburn and Coalburn. After test excavating above the old Acadia Coal pits, in 1996 a surface mine opened in Stellarton. Among its unionized workforce of 30 (2007) are men with coal in their blood: men who mined by hand in the twilight days of the Drummond and moved on to run the giant cutting machines in Westray. In the open pits of the Pioneer mine, they adroitly operate bulldozers, excavators and specialized machinery. An area comprising 120 hectares will be surface mined in Stellarton. As mining advances, the depleted pits are backfilled and sodded, so the reclaimed land can be put to productive use. Where once they practised their craft by hand, miners at the Pioneer surface mine in Stellarton must be skilled operators of heavy equipment. The NOVAMINER 2000, designed specifically for highwall mining in Pictou County’s steeply dipping coal seams, was developed and built in Antigonish, Nova Scotia, by Nova Construction Company Ltd., parent company of Pioneer Coal. 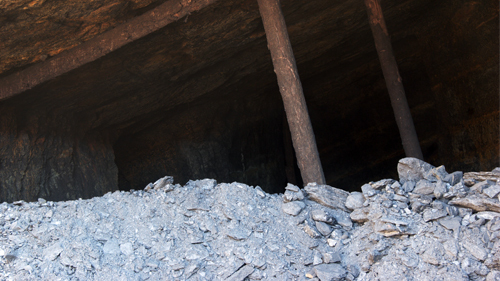 “Highwall” is a means of extracting coal from seams exposed by surface mining. The method is used worldwide, but operations were limited to 15 degrees until the NOVAMINER successfully mined the Foord seam, which dips at 26 degrees. This mining system can extract coal to a depth of 1000 feet. Entry is made at the face of the exposed seam, perpendicular to the wall of coal. As the continuous miner progresses down the seam, 40-foot belt conveyors are attached to move the coal up to the launch vehicle located in the open pit. The system is controlled remotely by an operator. No one is required underground.